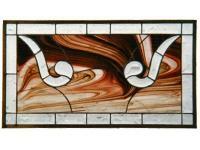 bevels surrounded by red streaky glass and perimeter bevels on this rectangular window panel. 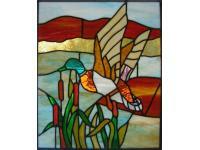 Mallard duck custom design, flying over a marsh, sent to a home in Switzerland. 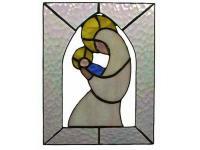 It is done as a frame within a frame to add depth. 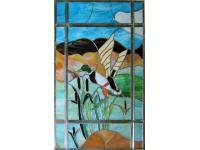 A rectangle window panel depicting a Mallard duck in flight over a marsh with bull rushes and rolling hills.